The post—Cold War decade of the 1990s has been labeled the decade of human rights, the decade in which, Michael Ignatieff claims, “human rights has become the dominant moral vocabulary in foreign affairs” (2002, A29).1 Not incidentally, it has also been described as the decade of life narratives, what commentators refer to as the time of memoir. Many of these life narratives tell of human rights violations. Victims of abuse around the world have testified to their experience in an outpouring of oral and written narratives. These stories demand that readers attend to histories, lives, and experiences often vastly different from their own. As people meet together and tell stories, or read stories across cultures, they begin to voice, recognize, and bear witness to a diversity of values, experiences, and ways of imagining a just social world and of responding to injustice, inequality, and human suffering. 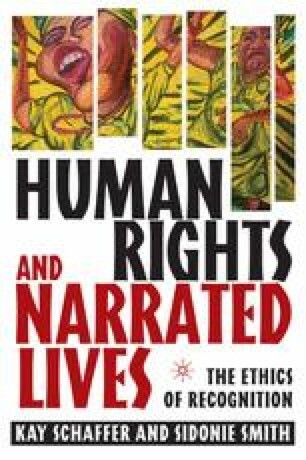 Indeed, over the last twenty years, life narratives have become one of the most potent vehicles for advancing human rights claims.